Gorgeous indoor, outdoor living at its finest! 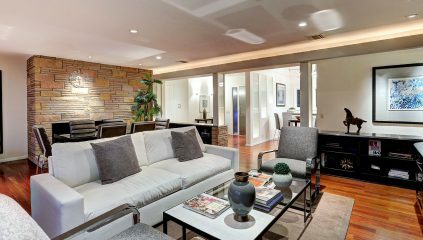 A perfectly located classic mid-century modern updated in the Outpost estates of the Hollywood hills. This open bright sunny floor-plan boasts beauty of city and mountain views. Three spacious bedrooms with an over-sized master suite, 2 full bathrooms, full separate laundry room, gourmet chef cooks kitchen with granite counter tops with stainless steel and Viking and sub zero appliances. Garage floor is especially designed for your best cars and has an EV charger. Private and quiet at the end of the cul-de sac. Spectacular ocean to downtown views. Minutes from the 101, Hollywood and the Valley. Plenty of storage with large hidden room below. Walking distance to Runyon canyon for hiking. Very private street and great for dog walking.